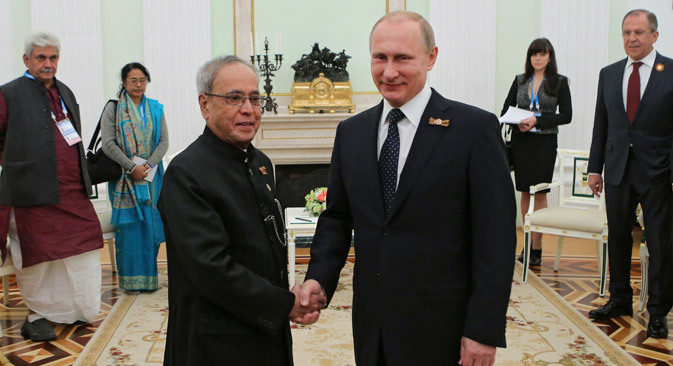 Russian President Vladimir Putin (R) and his Indian counterpart Pranab Mukherjee shake hands during their meeting in the Kremlin in Moscow, May 9, 2015. In a message of greetings to Indian President Pranab Mukherjee on the occasion of the 69th Indian Independence Day, Russian President Vladimir Putin conveyed his wishes for the peoples’ prosperity and well-being. Russian President Vladimir Putin sent a warm message of felicitations, “with all my heart,” to the Indian leadership and people on the eve of India’s 69th Independence Day. India gained independence from British colonial rule on August 15, 1947. “Russian-Indian relations, based on long-standing traditions of friendship and mutual respect, have attained the level of special and privileged strategic partnership. We attach great importance to the launch of procedure for India’s joining the SCO, which opens up new vistas for broader and productive cooperation between our nations,” Putin said in his message to India’s President and Prime Minister. President Putin met the Indian President who visited Moscow for the Victory Day celebrations on May 9, and India’s Prime Minister Narendra Modi who visited Ufa in July for the BRICS and SCO summits.